carburetor, and the glass bowl (fig. 4-8). The most common configuration is the replaceable in-line filter. these are in-line filter elements that fit in the carburetor inlet or inside the fuel tank. 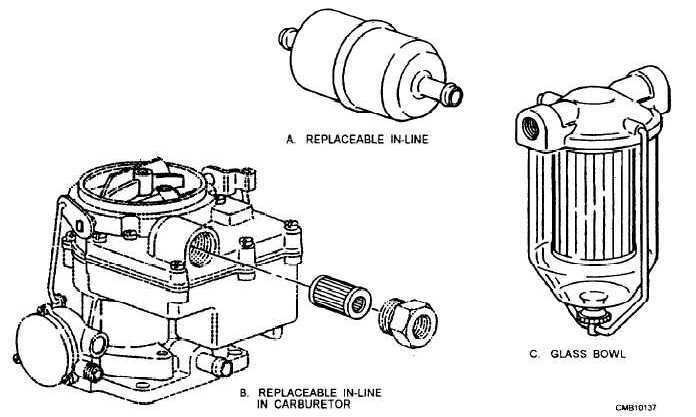 Fuel filter elements can be made from treated paper, ceramics, sintered bronze, or metal screen (fig. 4-9). However, there is one filter element that differs from the others. It consists of a stacked pile of laminated disks that are spaced 0.0003 inches apart. As the fuel passes between the disks, foreign matter is blocked out. These filters are replaced when the flow of fuel is restricted. Fuel filter service involves periodic replacement or cleaning of system filters. It may also include locating clogged fuel filters that are upsetting fuel system operations. Paper elements must be replaced when clogged or after prolonged use. Sintered bronze fuel filters can usually be cleaned and reinstalled. A clogged fuel filter can restrict the flow of fuel to the carburetor or injectors. Engine Performance problems will show up at higher speeds. Some fuel filters have a check valve that opens when the filter becomes clogged. This will allow fuel contaminants to flow into the system. When contaminants are found in the filters and system, the tank, the pump, and the lines should be flushed with clean fuel. Always refer to the service manual for information concerning service intervals, cleaning, and replacement of all system filters. The fuel pump delivers fuel from the tank to the engine under pressure. There are two basic types of fuel pumps - mechanical fuel pump and electrical fuel pump. Figure 4-8. - Fuel filter configurations.